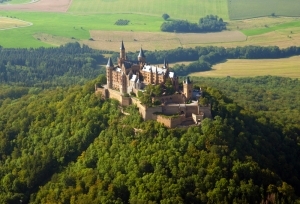 Hohenzollern Castle, one of the most beautiful German castles, is located at the periphery of the Swabian Alb, a few dozen kilometres from Stuttgart. 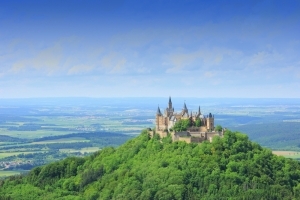 The architecture of the castle is an extraordinary combination of medieval asceticism, Gothic mysticism and charming Neo-Romantic style, which makes it similar to the famous Neuschwanstein Castle. Great structure, located on the very top of the mountain, at an elevation of 855 m, shrouded in a dense fog which often occurs in this area of Germany. 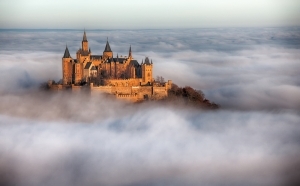 At times like this, it seems that the Hohenzollern Castle literally floats above the ground, which explains why it is called by the locals “The Castle in the Clouds”. 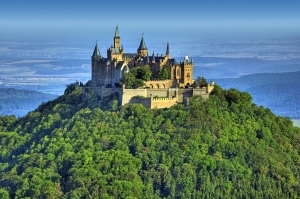 In relation to the fact, that the castle is located on the top of the mountain, you may use a special lift to get there. A single ticket (uphill) costs EUR 1,90, return ticket costs EUR 3,10. A walk to the castle may prove difficult due to the fact that the road leading to it is very winding. The hike takes about one hour. However the picturesque views of the surrounding area and clean air in the woods covering the mountainsides make difficulties less noticeable and easier to overcome. 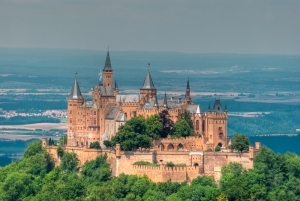 The majestic Hohenzollern Castle enjoys enormous popularity among the tourists – it has over 300.000 visitors from various countries per year. Unfortunately, just a few of 140 castle rooms are available for the public – for organized groups only. It usually takes about 45 minutes to go through the elegant, great chambers and to see both art and jewellery collections as well as to visit the treasury, where the great crown of the Prussian kings is the most valuable exhibit. Several courtyards and old chapels are available or individual tourists. After sightseeing you may visit souvenir shops or take a break in the coffee bar, from which you can enjoy the beautiful view of the charming Swabian Alps. In the open air theatre, which is situated within the castle, you may watch various historical performances, operas or a show of a different type. Fireworks are organised at the Hohenzollern Castle on the warm August evenings and in autumn you can admire the hunting falcons there.